This is an option that uses the individual’s picture and allows you to add whatever fields you want that are included in the Picture Export. This is an option on the blue Toolbar under the cloud icon in the Export Excel section. This export includes the Image URL that is needed for adding the picture to a directory. 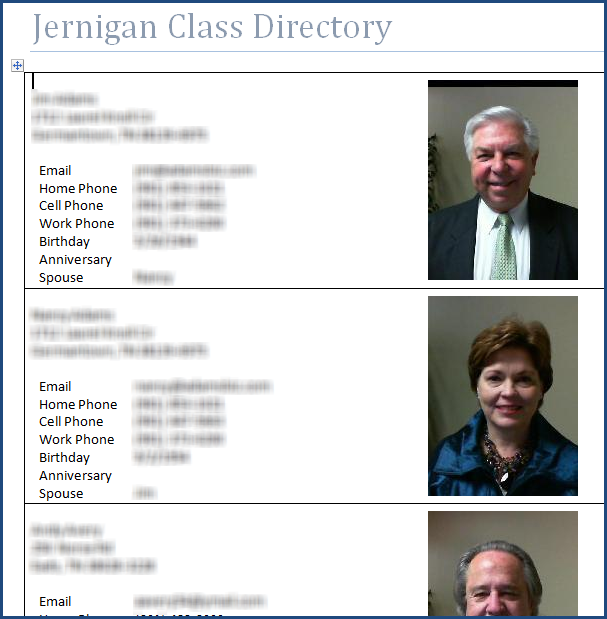 TouchPoint has both a Picture Directory (using the Individual Photo) and a Family Picture Directory (using the Family Photo) as options on the blue Toolbar. These are one-click options that are very simple to produce. The only reason you would want to use the option described below would be if you want to add or remove fields or change the layout. We plan to publish recipes for the existing Directories that are on the Toolbar so you will be able to customize those instead of using this mail merge. These recipes will be published in late 2017. We have tried this on a Mac, and the pictures do not display properly in the Excel Pictures export. However, they will display on a PC. Find your target list of people that you want included in the directory. Then select the blue Toolbar > Cloud > Export Excel > Pictures . Open the spreadsheet from your downloads folder if it does not open automatically. The spreadsheet will contain the image URL for each person with a photo on their record in addition to the individual contact information. Save as .xls and give it a name. Open Microsoft Word and start a Word/Mail Merge. The data source will be the xls file you saved in the step above. You can now insert any MergeFields into the document you want. Continue below to insert the image and complete the merge. This is a bit different than inserting other data. In the Word document, place the cursor where you want to position your image. On the Insert Menu (or the Ribbon on Word), choose Field (see QuickParts on Word 2010). Under FieldNames, select IncludePicture, and click ‘OK’. You may see a message something like Filename not specified. That’s OK. That’s normal for this process. Place your cursor just to the right of INCLUDEPICTURE and insert a space. Now from the Mailings Menu, insert the MergeField ImageUrl. Press Alt + F9 to turn off fieldcodes. You will either see the first picture or a red x with the text “The linked image cannot be displayed”. This is normal. Now choose to Complete the Merge or Finish & Merge to merge “To new document” or “Edit Individual Documents”. In the new document, press Ctrl + A to select all, and then press F9 . Your images will be downloaded into your document. You will want to save this template so that you can use it with a different Excel file anytime you want a picture directory using this same format.